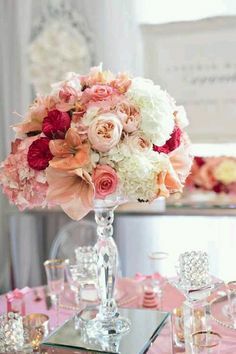 Making your own floral centrepieces for your wedding is a great way to add your personal touch to an important occasion. A simple centerpiece using a clear glass vase is an easy way to create something classic and beautiful, without too much difficulty. You’ll need anywhere from 50 to 75 flower stems, depending on the size and number of arrangements you need. It shouldn’t take any longer than 30 to 60 minutes to complete. Make them a day before to avoid leaving yourself too many things to get done on the day of the wedding! Flowers with large blooms are good for this project, especially roses. You’ll probably want to avoid anything that’s too delicate. Once you’ve decided on your flower, choose your container. A simple glass globe or cube works well and lets your flowers make the statement. You’ll also need a sharp knife or stem cutter and floral tape to hold the stems together. Make sure your containers are clean and filled with water. Start by filling a bucket or sink with water. Place the stems in the water and make angled cuts about two inches from the bottom of each stem. Leave them in the water for a few minutes longer to make sure they drink up some water. Now, place all the stems into a half-filled bucket or sink of cool water until you’re ready to start assembling the centerpieces. Note: leave the stems long at this point, you can trim them once you’re satisfied with the look of the arrangement. Place 4 stems together to form a square shape. This will be the center of the arrangement. Start placing the other stems around the center to form a dome. As you continue to create the arrangement hold it to the vase to make sure the width is in balance with the container. Make any adjustments you feel necessary for the look you want. Once you’re satisfied with the arrangement, wrap the stems with floral tape roughly 4 inches below the head of the flowers. Now hold the flowers up beside the container to see how much of the stems needs to be trimmed. As before, cut the stems at an angle to help better absorb the water. Depending on the look you want, you can leave the stems as they are to fan out in the vase, or you can bind them near the bottom with floral tape for a more finished look. Now gently place your flowers in the containers. Mist them and, if available, keep them in a refrigerator until you’re ready to use them. If you can’t refrigerate them, keep them in a cool or air-conditioned area and don’t expose them to any heat or light. Adding a drop of lemon-lime soda or bleach into the water will make the blooms last longer. Category DIY Flowers | Tag diy flower centrepiece, flower centrepiece | Bookmark the permalink.